Cinco de Mayo IS NOT Mexico’s Independence Day. Most Americans confuse this holiday with Mexico’s Independence Day, but that date is Sept. 16. Cinco de Mayo IS a celebration of the Battle of Puebla. The holiday commemorates the Mexican Army’s 1862 victory over France at the Battle of Puebla during the Franco-Mexican War (1861-1867). Cinco de Mayo IS a celebrations of underdogs. Why make such a big deal over one victory? The win at Puebla was a huge deal for Mexico because the Mexican Army went into the battle as underdogs. They had no training and no equipment and were vastly outnumbered against the well-armed, well-disciplined and well-funded French, who up until that point had defeated them at every turn. Yet, they prevailed. Cinco de Mayo IS NOT really a big deal in Mexico. With all of the fuss around May 5th here in the U.S., you would think it was the biggest holiday in Mexico – but that’s not the case. That honor goes to Mexican Independence Day. Still, Mexicans do celebrate the day with family get-togethers, fireworks, dancing and lots of yummy food. Cinco de Mayo IS a holiday for everyone to celebrate. Many towns around the U.S. have festivals, fiestas, dances, fireworks, food and music in honor of the holiday. It’s a great time to teach your kids about the culture, people and history of Mexico – or even learn a little yourself. The holiday of Cinco De Mayo, The 5th Of May, commemorates the victory of the Mexican militia over the French army at The Battle Of Puebla in 1862. It is primarily a regional holiday celebrated in the Mexican state capital city of Puebla and throughout the state of Puebla, with some limited recognition in other parts of Mexico, and especially in U.S. cities with a significant Mexican population. It is not, as many people think,Mexico’s Independence Day, which is actually September 16. The battle at Puebla in 1862 happened at a violent and chaotic time in Mexico’s history. Mexico had finally gained independence from Spain in 1821 after a difficult and bloody struggle, and a number of internal political takeovers and wars, including the Mexican-American War (1846-1848) and the Mexican Civil War of 1858, had ruined the national economy. During this period of struggle Mexico had accumulated heavy debts to several nations, including Spain, England and France, who were demanding repayment. Similar debt to the U.S. was previously settled after the Mexican-American War. France was eager to expand its empire at that time, and used the debt issue to move forward with goals of establishing its own leadership in Mexico. Realizing France’s intent of empire expansion, Spain and England withdrew their support. When Mexico finally stopped making any loan payments, France took action on its own to install Napoleon III’s relative, Archduke Maximilian of Austria, as ruler of Mexico. France invaded at the gulf coast of Mexico along the state of Veracruz (see map) and began to march toward Mexico City, a distance today of less than 600 miles. Although American President Abraham Lincoln was sympathetic to Mexico’s cause, and for which he is honored in Mexico, the U.S. was involved in its own Civil War at the time and was unable to provide any direct assistance. 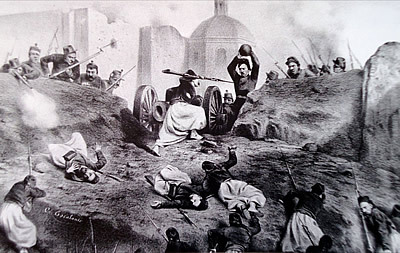 Marching on toward Mexico City, the French army encountered strong resistance near Puebla at the Mexican forts of Loreto and Guadalupe. Lead by Mexican General Ignacio Zaragoza Seguin, a smaller, poorly armed militia estimated at 4,500 men were able to stop and defeat a well outfitted French army of 6,500 soldiers, which stopped the invasion of the country. The victory was a glorious moment for Mexican patriots, which at the time helped to develop a needed sense of national unity, and is the cause for the historical date’s celebration. Maximilian’s rule of Mexico was also short lived, from 1864 to 1867. With the American Civil War now over, the U.S. began to provide more political and military assistance to Mexico to expel the French, after which Maximilian was executed by the Mexicans – his bullet riddled shirt is kept at the museum at Chapultepec Castle in Mexico City. So despite the eventual French invasion of Mexico City, Cinco de Mayo honors the bravery and victory of General Zaragoza’s smaller, outnumbered militia at the Battle of Puebla in 1862. For the most part, the holiday of Cinco de Mayo is more of a regional holiday in Mexico, celebrated most vigorously in the state of Puebla. There is some limited recognition of the holiday throughout the country with different levels of enthusiasm, but it’s nothing like that found in Puebla.